Wow! How did I miss such a topic? This "kettle" is actually a remix of Russian Samovar (samo-var = self-boil): http://en.wikipedia.org/wiki/Samovar - the perfect boiling device of 18th century. I didn't know it's available in techno shape these days. Will definitely consider getting one. Some thoughts on the Kelly device design compared to the ancient beauty. - First off, the Samovar have removable top lid, so it's much easier to clean, faster to fill and pour out, more versatile if you plan not only water boiling. - There are 2 handles pointing upwards (on the sides), so it's safer and easier to move it around and to pour out. - It's equipped with tap at the bottom, so it easier to dispense small amounts of hot water (for tea). 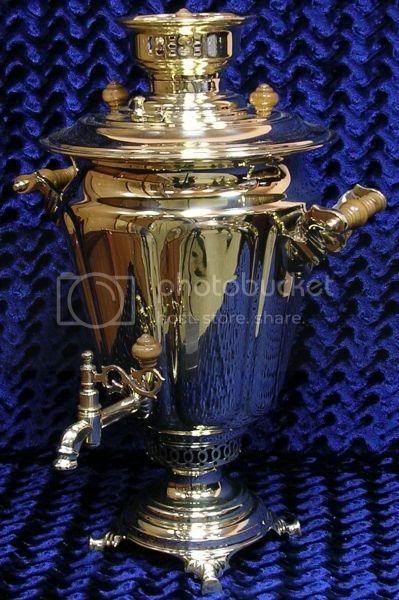 - The conic shape of Samovar is proved to boil water more efficiently in an entire volume. - There is no separate bottom part in samovar design (cooking ring? ), all the fuel is turning to ash right in the chimney. - The important accessory to Samovar is chimney extension tube, which could be stored inside of the samovar main reservoir. - Another popular chimney attachment is the small teapot warmer (for priming tea leaves). Ever since I can remember I've always wondered how those things were used. I always thought they were just for decoration. Thanks for the info. Somethings wrong though. The one in the photo looks out of place. I think it belongs in a smoke filled room with some gruff looking Russians having heated converstations and playing cards. At least thats the way they do it in my neck of the woods. Looks like a trophy to me. I was about to ask what sport he won. Isn't it beautiful? And functionality is the same if not superior compared to the Ugly Kelly - ages of the steam technology polishing By the way, the "decorative" side ribs aren't simply decorations. The copper walls are quite thin, so some reinforcement ribs are crucial to keep the device relatively lightweight and durable. By the way, I'm not arguing against the Kelly Kettle. Just giving some ideas of possible improvements, like the BobS made heavy duty handle. For transit, so far I have just used the cardboard box for my Thermette and large Kelly too. My small Kelly is in a nylon stuff sack. I have not done the handle modification to my Thermette but it really does need one of Bob's sort of handle to make it a safe boiler. I think these devices are simply perfect for an emergency kit. Around here tons of down branches, cones, bark, needles and the like are available at all times and even slightly damp will burn. The half gallon from the Thermette is best suited for larger groups and static locations, but I would not hesitate at all to take it or the larger Kelly along on a canoe trip. The one pint Kelly makes for a pleasurable way to brew up for a lunch on the trail if you pack is large enough to take the bulk. It is not much heavier than a stove/pot/fuel bottle combo, and makes for a relaxing brew up, but it does take a good amount of room (about the size of a large thermos bottle). Over at one of the super efficient light backpacker sites there is a small following for Kelly's on the trail, as there is never any fuel to carry...but these guys eat nothing that requires much but hot water (nor do they seem to eat anything interesting). Good report on the camp Thermette Bob. A crude but damned effective device. Does anyone have one of these? And if so, how does it work? I've owned a Kelly Kettle for about a year now. I am impressed with the quick boiling time, and miniscule amount of fuel required. If you scroll down you'll see the kettles. 1. Kelly Kettle pot holder. This device sits atop the chimney and works well for cooking in a small pot whilst boiling your water. A great way to transport water, and store the KK when not in use (just be sure to let it cool-off first!) I also store a dozen or so sticks of cedar kindling along side the KK. That way I can always be sure of having dry fuel. (2 sticks of cedar kindling will boil a kettle full of water!) I also throw in a few homemade sawdust-candle wax-egg carton firestarters. 3. Insulated plastic cup system. Works great for cooking dehydrated foods and having a hot bev.